Iranian President Mahmoud Ahmadinejad said Wednesday that international sanctions imposed over his country’s nuclear drive had caused “problems”, but insisted they had not stopped progress. 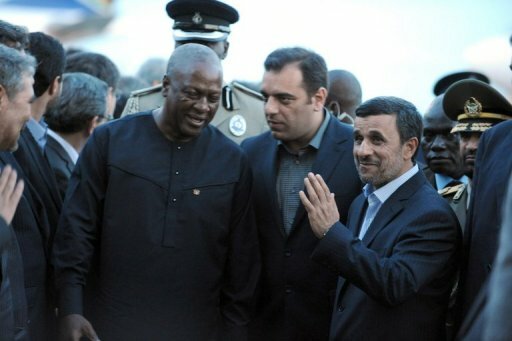 Ahmadinejad spoke in Ghana as he wound up a three-nation tour of west Africa that also took him to Benin and Niger, the world’s fourth largest producer of uranium. “If a country is really determined to achieve progress, it will achieve it in spite of colonial pressure or sanctions,” he said through an interpreter after signing agreements with Ghana on areas including education and agriculture. The United Nations has imposed four rounds of sanctions on Tehran over its nuclear programme, specifically its refusal to stop enriching uranium. Last week, Iran unveiled a new uranium production facility and two mines, only days after talks with world powers on its nuclear programme again ended in deadlock. Western powers suspect Tehran of developing a covert programme aimed at having the capacity to produce a nuclear bomb. Iran denies this and says its work is being conducted for energy and medical purposes. The Ghana leg of Ahmadinejad’s trip came after a major earthquake hit southeastern Iran, leaving one person dead, while 40 were killed in neighbouring Pakistan. Ahmadinejad did not comment in public on the earthquake, though Ghana President John Dramani Mahama expressed his condolences. Ghana, a country of some 25 million people, is a major producer of gold and cocoa with a nascent oil industry.